When people think of casino table action, the first game that comes to mind is often Blackjack. Many players enjoy the game of Blackjack due to its perceived favorable odds and fast pace of play. Blackjack is one of the simpler table games, with relatively few betting options. The player's ability to directly impact their odds of winning or losing make Blackjack betting strategies an artform, however. To begin a Blackjack hand, players must bet at least the table minimum. For example, at a $5 to $500 table, the minimum bet to play is $5. The player may bet any amount up to the maximum of $500. Island Resort & Casino allows players to play two hands at once. To play two hands, players must bet double the table minimum on each hand, and make the first hand good before continuing to the second hand. Blackjack is played with two or more standard decks of 52 cards. The object of the game is to create a hand as close to 21 as possible, without busting, or going over 21. Players whose hands total closer to 21 than the dealer win. Face cards are valued at 10, while Aces are valued at either 1 or 11, depending on the player's hand. Players who receive a two-card combination equaling 21, such as a 10 and Ace, have what is known as blackjack. 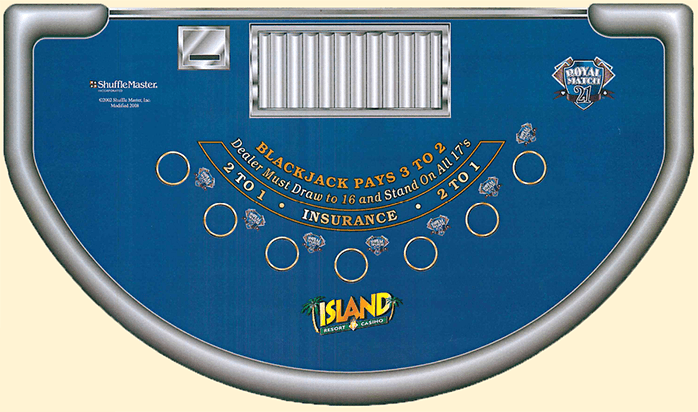 At Island Resort & Casino, all blackjacks pay 3 to 2 of the original bet. If the dealer and a player both have blackjack, the bet is pushed. To begin the hand, each player is dealt two cards face-up. The dealer also receives two cards; however, one is dealt face-down and the other face-up. Once all cards are dealt, each player has a range of options to take action on their individual hands. Stand: A player who is satisfied with the total of their hand may stand. This means that the player does not want to be dealt any additional cards. Hit: A player who does not feel that their hand can beat the dealer may hit, or take additional cards. A player may hit as many times as they like until they reach a satisfactory hand, or the total of their hand exceeds 21. Double down: Players who feel confident about the strength of their hands may choose to double down. If a player chooses to double down, they must match the value of their original bet and will receive only one additional card. Often, players double down when the value of their dealt cards equals 10 or 11. Split: Players who are dealt matching cards, such as a pair of 8s, may choose to split the pair into two separate hands. To split, the player must make an additional wager matching the value of their original bet. Once split, the player takes action on each hand individually, and must complete action before moving to the second hand. For example, if a player is dealt a pair of 8s and chooses to split, the may hit the first 8 until satisfied with the hand's value or the total exceeds 21. They then move to the second 8 and do the same. Split Aces receive one card only. Take insurance: If the dealer's face-up card is an Ace, players may choose to take insurance. Insurance may be taken for half of the player's original bet. If the dealer's hand is blackjack and the player has taken insurance, the player is paid 2-1. Insurance helps to protect the value of the player's original bet in case the dealer has blackjack. Once all players have completed action, the dealer's face-down card is revealed. If the dealer's hand totals 16 or lower, they must hit. If the dealer's hand totals 17 or higher, they must stand. Once the dealer has completed action, their hand is compared to the players'. If a player's hand is closer to 21 than the dealer, the player wins their bet. If the dealer's hand is closer to 21, the player loses their bet. If the hands are equal, the bet pushes and no chips are exchanged either way. Ask for help: If you have questions regarding the rules of the game or the betting process, just ask. Our table supervisors and dealers are always available to answer questions and offer advice. Gamble responsibly: Gambling is a risk – never bet more than you can afford to lose. If you or a loved one have a gambling problem, we are here to help. 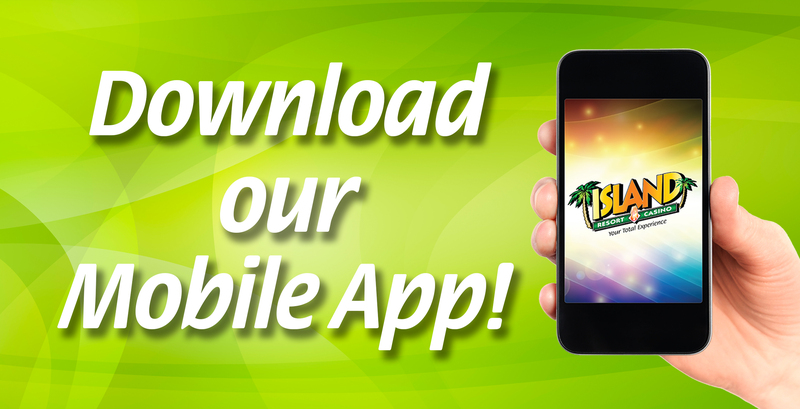 Register for an Island Club card: Before taking to the tables, be sure to register for an Island Club Card. With your club card in hand, you'll earn rewards redeemable for hotel, dining and entertainment, as well as slot and bingo credits. For help planning your next visit, please call 1-877-475-7375.